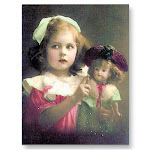 Dolls from the Attic...Mis Muñecas: Origin of the Term "Milliner's Model Doll"...What's in a Name? 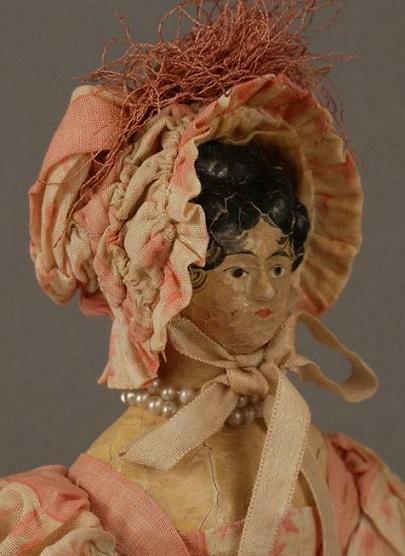 Origin of the Term "Milliner's Model Doll"...What's in a Name? “That which we call a rose…By any other name would smell as sweet." 12" Milliner's Model Doll in shadow box filled with dried flowers, feathers and sea shells. 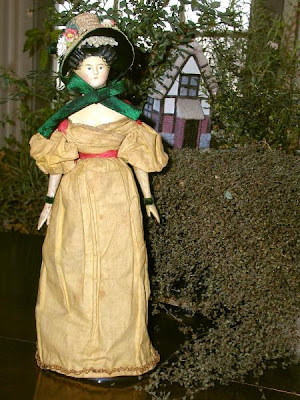 The dolls is wearing her original costume that includes a knitted hat. Shadow box retains original hand rolled glass front. 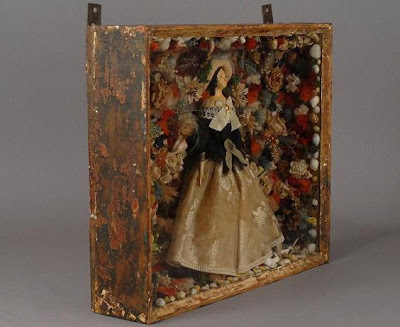 German Papier Mache with moded ringlets and painted swirls of locks down her back. 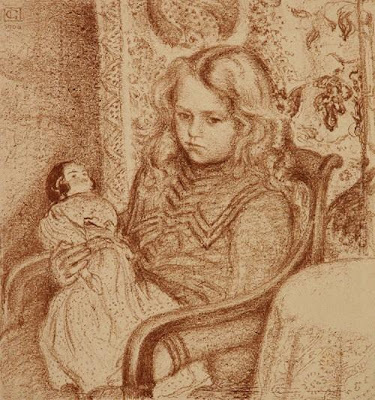 "Young Woman with Jewelry" Note the similarities with the hairstyle of the doll featured above. 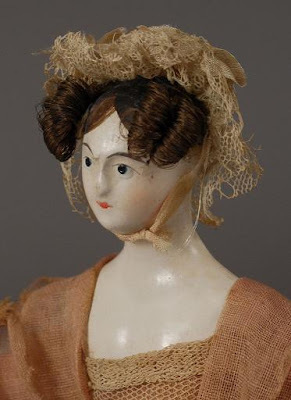 The first mass-produced molded papier mache heads were introduced at Sonneberg Thuringia in the early 19th century. 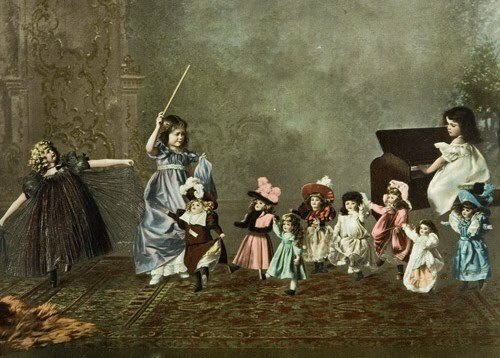 At this time the German toy trade was expanding to embrace a world market. 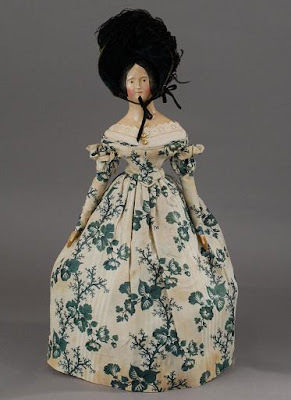 Papier mache heads were used extensively on a body made of fabric or leather, with the characteristic bands of leather neatening the joints of the wooden, or papier mache lower arms and legs. Milliner's Model Winners at a UFDC Reg. 14 Competitive Exhibit. Category: Milliner's Model types, or type body. Beautiful 17" Kestner Milliner's, wearing a period bonnet of forest green silk velvet, featuring an ostrich plume. The doll's attire is a chintz print, with a rich deep green over cream background. Wonderful styling of the sleeves. Small German Milliner's Model, 7 3/4” perfect in a large scale doll house. Black-painted molded hairstyle, and a white kid leather body with hard-carved wooden arms and legs. 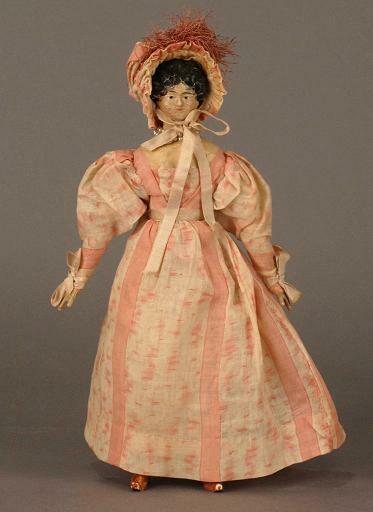 Original colorful silk dress and a charming straw hat. This Papier Mache doll is all original. 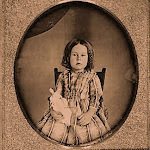 She can be dated to the end of the first decade of the 1800s. 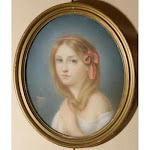 Her hairstyle is the fashion of the late teens and early 1820's with its multiple side curls and its braided top knot. She has painted tendrils along the side of her face. Her body is leather with wood hands and feet attached with paper bands. She is 12 inches tall with her hat . Classic Milliner's style leather body on an exquisite 10 1/2" doll. Original hand sewn dress featuring Leg o' Mutton sleeves and matching bonnet. 4. 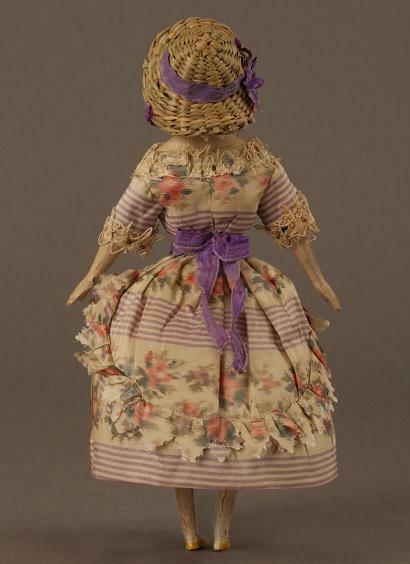 There is no record of these dolls being used for this purpose. They are also referred to as "Varnished Heads" in the 1829-1833 Day Book of Lewis Page at the Henry Francis du Pont Winterthur Museum, and according to Christiane Grafnitz, the proper term for the Milliner type dolls are German Papier Maches with wooden arms and legs. 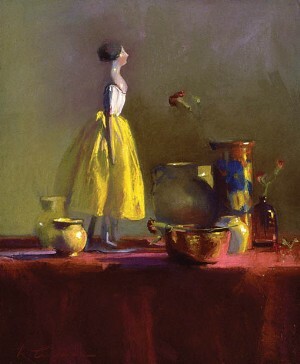 "Nina Coultis" ca. mid 1800's... 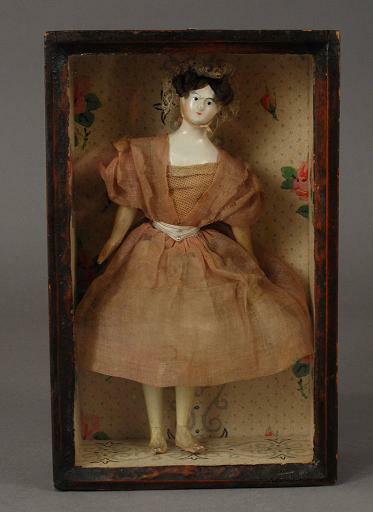 This is a rare 7 1/2" German doll with applied human hair on a painted head. 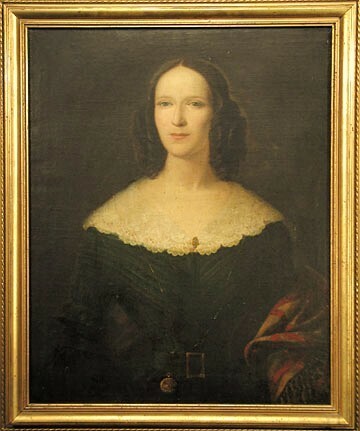 At one time she was part of a museum collection. "At the Millinery" Williamsburg, Va. 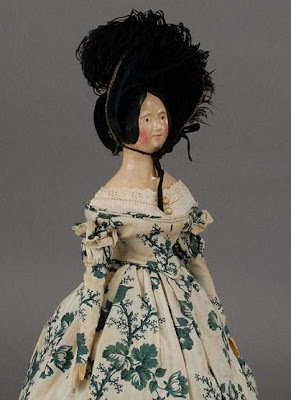 The name Milliner’s is a misnomer as they were never intended to be hat models, as it is hard to believe how these petite dolls with impossibly elaborate molded hairdos could ever have modeled hats. 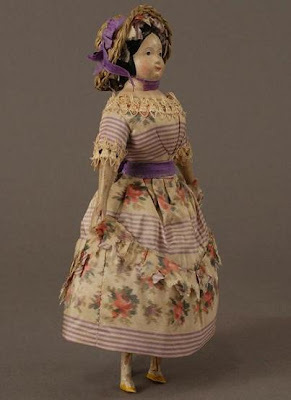 Many German dollmakers made Papier Maches that greatly resembled China dolls. 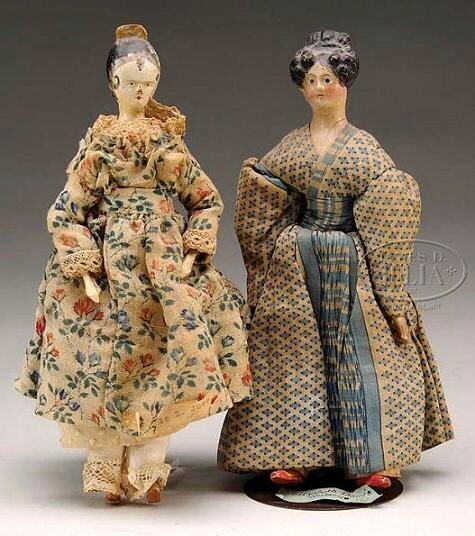 Some fashion dolls from the mid-1800s were made in France (predecessors to the later French bisque and china dolls). Later, some of the German Papier Mache dolls resembled their bisque sisters. I would highly recommend Gregory LeFever’s article: “Milliner’s Models, or Varnished Heads”, on the “Early American Life” magazine issue, of April 2010 on the subject of these dolls. It was a great source of information on creating this post. Muchas gracias Maria, por tu soporte continuo. Es maravilloso, Todo Lo Que nep explicas. Nos enseñas muchisimo. Muchas gracias. Abrazos para ti Carmen. Gracias por tu amable comentario. Marta esta información sobre las Milliner’s Models dolls es fabulosa, y las fotos también pues yo tomo ideas para hacer mis trabajos o sea me sirven de inspiración. Muchas gracias Leo. Me alegra mucho que mis articulos te sirvan de inspiracion. 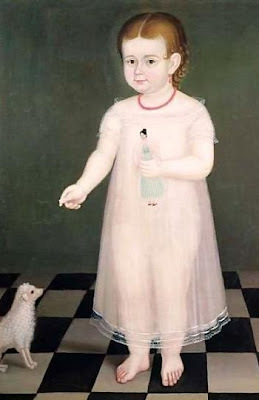 A veces pienso que mis post se alargan, pero es dificil escojer solo una o dos entre tantas muñecas bellas. 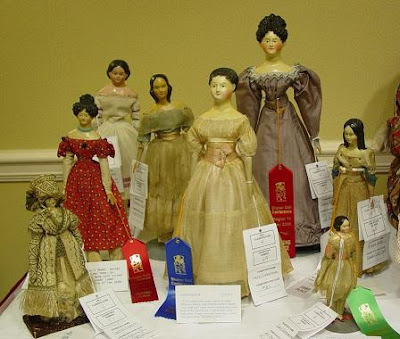 I want one of each of those gorgeous dolls! 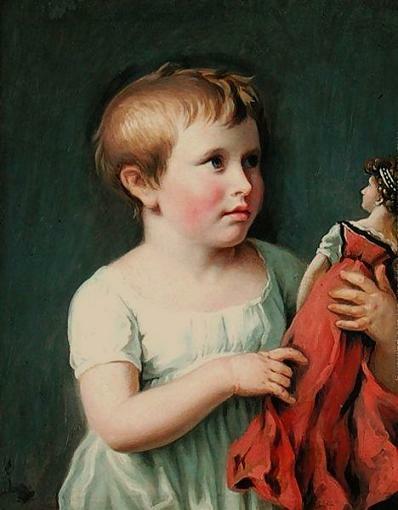 And the picture of the lil girl with her doll is just so sweet. Thanks for the beautiful pics. Aaaahhh a girl's gotta have her dreams! You and me both Carol!...if only that was possible. Thank you so much for your sweet comments. Thank you, Marta, for mentioning my husband's recent article on said topic. Another thing that I have learned is that the very word milliner used to mean a department store of sorts, because the root of that word is a thousand therefore one can find many things in such a shop. And so, milliner shoppe, as in historic Virginia was not at all to do with hats. 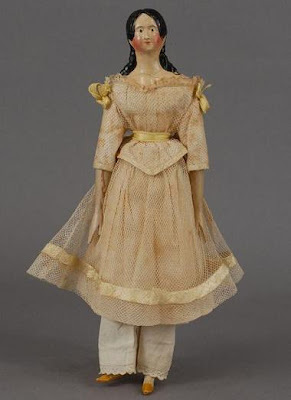 I really believe that there is a strong possibility that a doll dressed for a shop window might have simply been modeling the latest fabrics. One never knows! 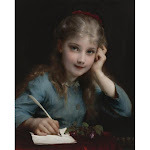 Oh what a wonderful blog! I am a fashion, culture, and history enthusiast who loves to sew and your thoughts and photos made me very happy. 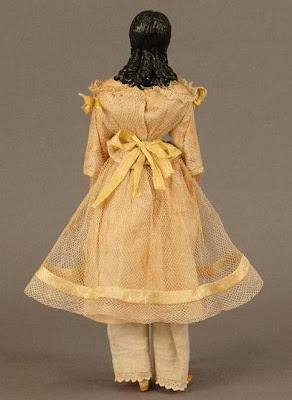 I'd been researching the history of true fashion dolls - actually used for promotion of haute couture - when I found this blog. Much appreciation! Thank you! Its always very rewarding when others can benefit from what I love so much. Yet another marvelous article! Thanks! I can clear up the milliner question, as I am in fact, a retired milliner. 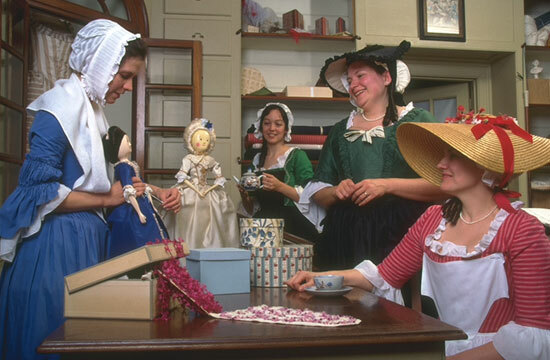 Originally milliner's shops were places one went, sometimes to have a dress made, but very often just to have it trimmed, and perhaps to have matching accessories made. So, you would make a plain dress at home, bring it to your milliner, and she would embellish it. 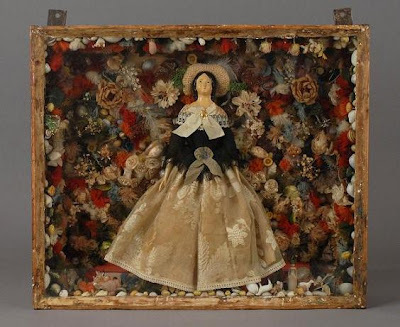 She might also embellish a fabric hat, but more often she would make those from scratch, since hats are made from specialized materials that your average lady would not have at home. Milliners were the first fashion designers. 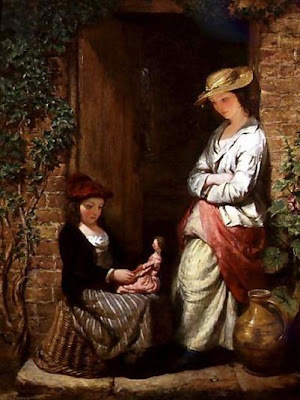 This has always confused people, because we now use the term "milliner" only to mean one who makes women's hats ( one who makes men's hats is morer plainly called a hat maker). 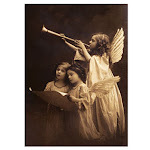 But knowing the association with embellishments, you can probably see how the word evolved now. practice of hanging one's bloody towels outside to dry. That charming pole may look like a peppermint stick to us now, but it symbolizes a bloody rag! Thank you Laurel...That is so interesting about the Barber Shop post! I guess the term "Multi-Tasking" could be applied here..LOL! Thank you for the information on Milliners. 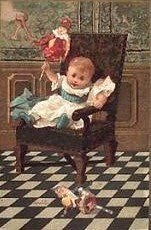 I have another post " Those Frills Flowers, Buttons and Bows" that covers more of the Milliner's occupation. Check it ou if you have time.